I've read quite a few short-stories by R.L. Stevenson including 'Dr. Jekyll and Mr. Hyde', The Beach of Falsea, The Bottle Imp, Markheim, Thrawn Janet, The Isle of Voices, Will O' The Mill, The Bodysnatcher, Providence and the Guitar, and The Enchantress. I must admit, however, to not remembering many of the stories with the exception of The Bottle Imp and Dr. Jekyll and Mr. Hyde, though I am brought back to the stories when I read a quick synopsis. 'Treasure Island' was the first novel I read by Stevenson, and I must admit that I enjoyed the adventure. There are some good moral lessons and honor is constantly referred to, but for the most part it is just a good pirate story. Stevenson has a way of keeping you interested and doesn't add much fluff... only content to add to the story. 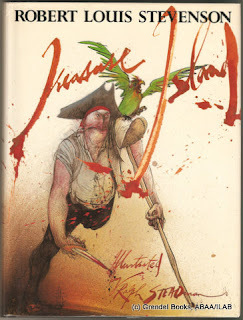 I was happy to finally put a book to a bunch of pirate references that we take for granted as just being in existence, which I assumed originated in this novel. John Silver was introduced, and I was surprised to know that he was a cook. The phrase 'Yo-ho-ho and a bottle of rum' as well as 'shiver my timbers' was referenced here. The island was called 'Skeleton Island' which is commonly referred to in pirate movies and peg-legged John Silver also has a parrot named 'Captain Flint'. John Silver was quite an interesting pirate - quite intelligent and always playing both sides. It was no wonder he was able to live in difficult times for a pirate with a severe physical deficiency (loss of a leg). There were a few things that made me chuckle in this novel. For some reason, I really found that the references to how bad rum is and how upstanding 'brandy' was, rather funny. At first, it seemed like Stevenson preached moderation of alcohol but he also had a distinction between good and poor alcohol, and this I found rather comical and indicative of British culture. I believe I read an abridged version of this novel as a child, and I wish I would have read the real thing. The prose was very simple and I found myself learning quite a lot about different tall-ship terms. Thank you for the pictures Wikipedia, they helped bring the novel to life for a land lubber like myself. I often laugh when I hear about someone wanting an 'easy read' and they pick up something by Dan Brown [poor Brown - I pick on him so much] to go sit on a beach. I would rather bring 'Treasure Island'... a light adventure read that stimulates the imagination. I think I'm learning that good beach classics seem to be anything written by Jules Verne or Robert Louis Stevenson. Any other recommendations for 'light' classics? Stevenson is great. He captured the imagination of many young readers with this book. I was one of them. Just a great, fun adventure story with great, memorable characters. I am really scared of this book. I made the mistake of reading Kidnapped instead of Treasure Island and it just wasn't very good. I love Stevenson's short stories and I absolutely adore Jekyll & Hyde, but I've been scared to read this one. I must remedy that. At some point. Hey you, just stopping by on the hop and follow. Treasure Island sounds like a good reread for me. Thanks for passing on the reading itch. Ha! Ha! Have a great New Year. Happy Reading!! !